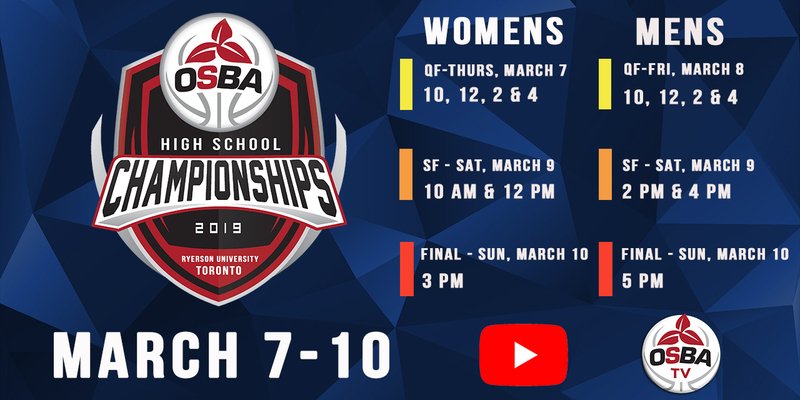 The Ontario Scholastic Basketball Association (OSBA) is excited to announce the upcoming 2019 OSBA Men’s and Women’s Final 8 Championship series will be played in Toronto at Ryerson’s Mattamy Athletic Centre from March 7th to 10th. All games will be streamed live on ontariosba.ca/osbatv. The premier event showcasing the top high-school aged talent in Canada will run concurrently with the 2019 U SPORTS Women’s National Basketball Championship, also taking place at Ryerson during Championship weekend. It’s a partnership that will allow fans of elite amateur basketball to enjoy both the best high school and university level talent all in one location, and encourages shared support between the female basketball players at both levels. The 2019 OSBA Final 8 Championships will crown a Men’s champion of the OSBA for the fourth time (2016 – Athlete Institute Prep, 2017 – Orangeville Prep, 2018 – TRC Academy), while a Women’s champion will be crowned for a third time (Lincoln Prep won both 2017 and 2018). Teams competing in the OSBA will continue their regular season schedules with playoff seeding on the line. The top teams in each Men’s and Women’s divisions receive a bye into the Final 8 with the other teams competing in play-in games for the chance to play in the Championships. Please see the official schedule format for the 2019 OSBA Final 8 Championships below. Tournament weekend packages ($20 Adults 18+, $10 Child) and daily general admission ($10 Adults 18+, $5 Child) ticket packages will be made available at the front desk table on game day. For tickets to the U SPORTS Final 8 Women’s Basketball Championship, use promo code OSBA. Media members seeking further information or accommodations should contact Devin Gray, Manager of Marketing & Communications, at 647-449-3217 or dgray@basketball.on.ca. QF - Game 8 1 vs 8 10 a.m.
QF - Game 9 2 vs 7 12 p.m.
QF - Game 10 3 vs 6 2 p.m.
QF - Game 11 4 vs 5 4 p.m.
SF - Game 12 W8 vs W11 10 a.m.
SF - Game 13 W9 vs W10 12 p.m. FINAL W12 vs W13 3 p.m.
QF - Game 7 3 vs 6 10 a.m.
QF - Game 8 4 vs 5 12 p.m.
QF - Game 9 2 vs 7 2 p.m.
QF - Game 10 1 vs 8 4 p.m.
SF - Game 11 W7 vs W9 2 p.m.
SF - Game 12 W8 vs W10 4 p.m. FINAL W11 vs W12 5 p.m. Written on 2019-02-05, in News.